If you haven’t already heard, the R&A and USGA have recently published new golf rule changes that will be coming into effect on 1 January, 2019. These new changes are expected to “modernise” the game with what is said to be the most significant changes in a generation. A lot of these rule updates reduce penalties and are designed to increase the overall pace of play. 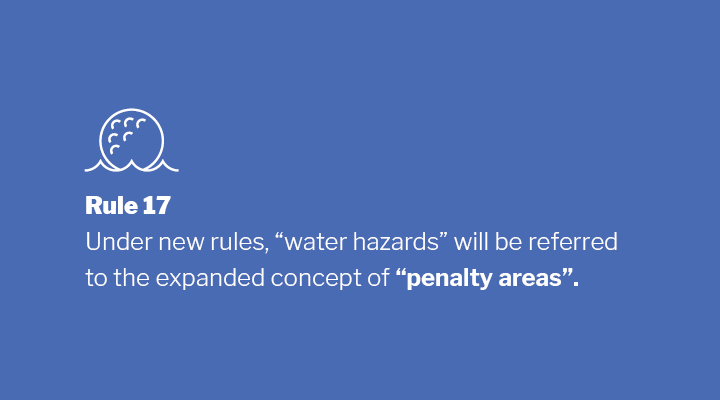 Some other key changes include the introduction of a new form of stroke play called “Maximum Score” and the transition from the term “water hazards” to the expanded term of “penalty areas”. The R&A have made it easy to learn these new rules and educate players with a complete online rule book, a visual search tool, and online resource centre. 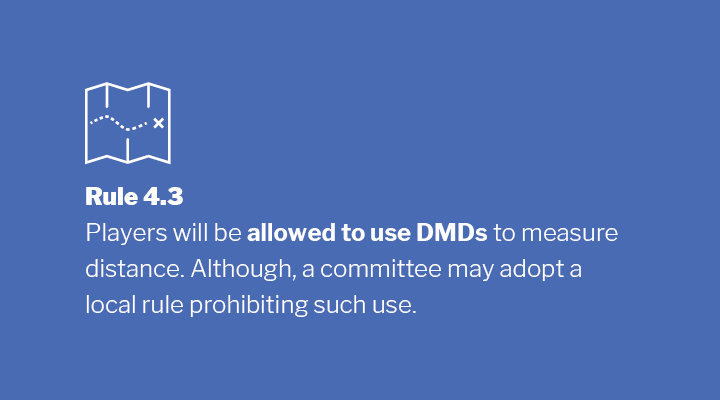 Furthermore, you can learn about the most important rule changes from our helpful guide below. Get excited for a new year of golf! 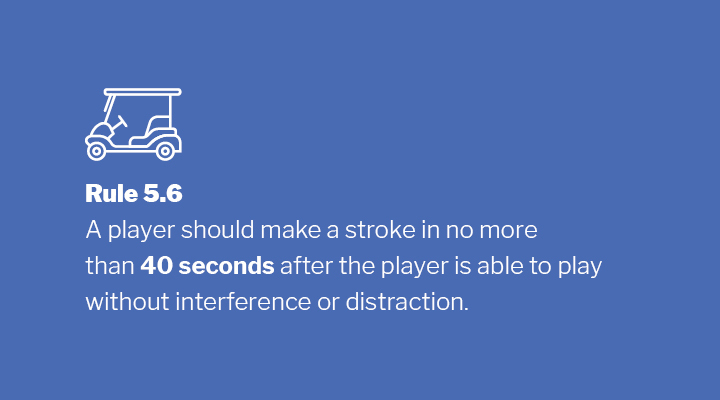 Previously if a player accidentally hit the ball two or more times when making a stroke, they would incur a one-stroke penalty. Under the new rules there will be no penalty for this unless the ball is deliberately hit in motion. If a player deliberately hits the ball in motion, they will be penalised two strokes in stroke play or a loss of hole in match play. All accidental deflections now have no penalty. If a player deliberately positions their equipment to deflect a ball in motion, they will receive a general penalty of two strokes in stroke play or loss of hole in match play. 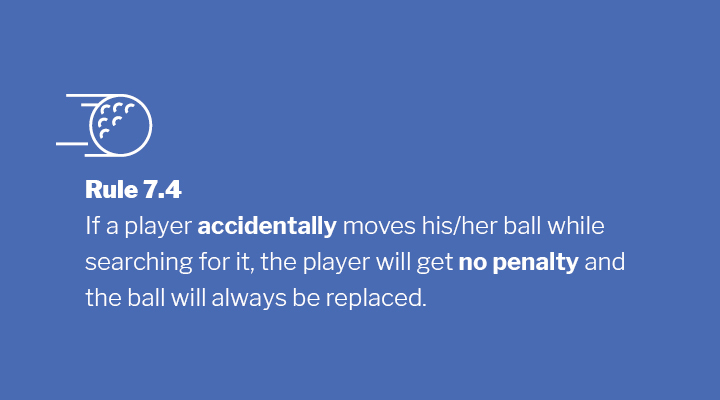 If a player accidentally moves the ball while searching, there will be no penalty and the ball will always be replaced in its original position. If the exact spot is not known, the player will replace the ball on the estimated original spot (including on, under or against any attached natural or man-made objects which the ball had been at rest under or against). 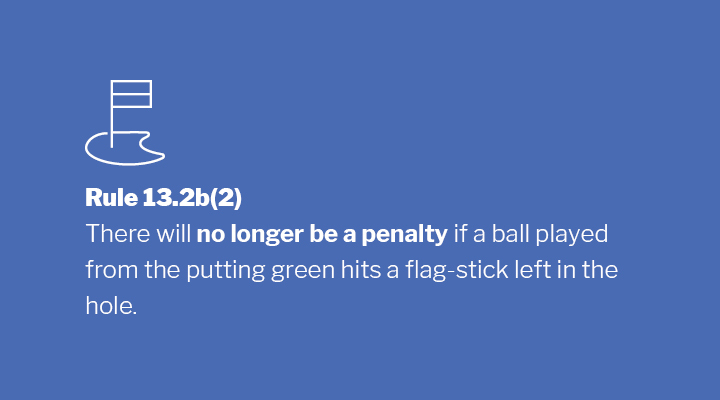 There is no longer a penalty for hitting a flag-stick left in the hole on the putting green. Although, players will not be required to putt with the flag-stick in the hole. They will continue to have the choice to have it removed (which includes having someone attend the flag-stick and remove it after the ball is played). If your ball hits the flag-stick and is not holed, play it as it lies. 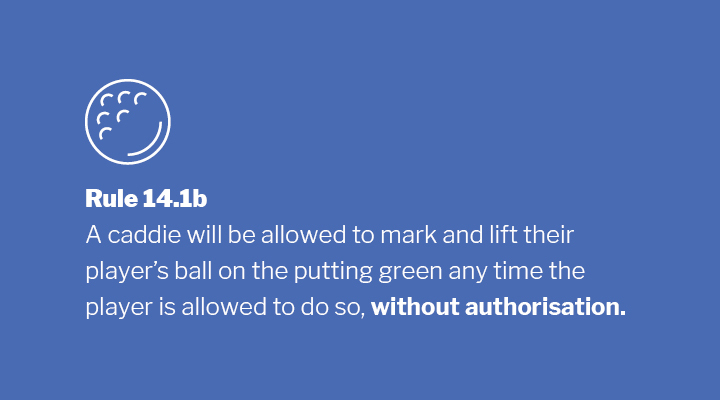 The player’s caddie will be allowed to mark and lift the player’s ball on the putting green any time the player is allowed to do so, without authorisation. 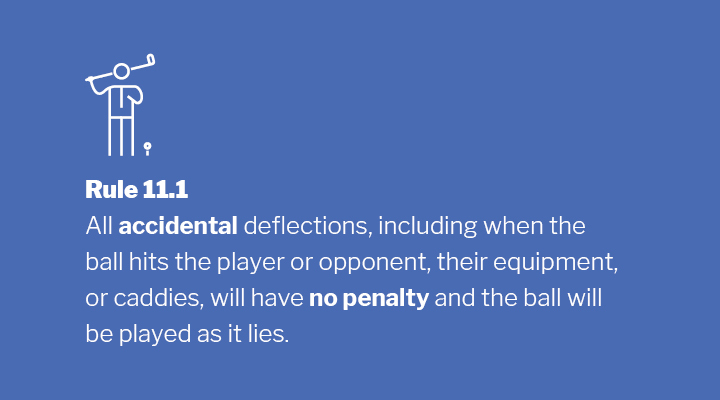 Since there is now no penalty for accidentally moving a ball, there is no risk of penalty to the player. This update will improve the flow of the game and help players with physical limitations. The player’s caddie must not deliberately stand on or close to an extension of the line of play behind the ball for any reason. 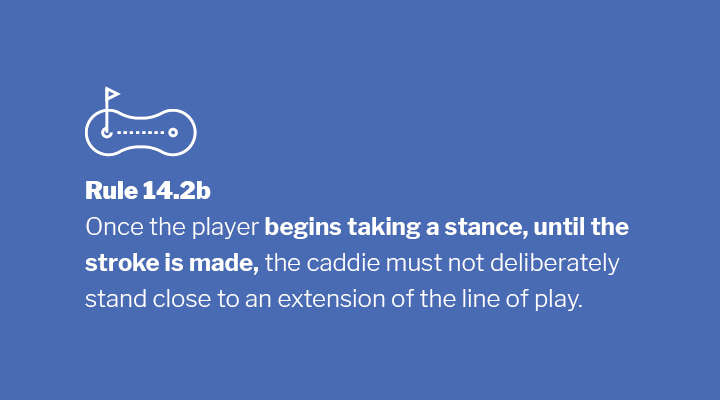 There will be no penalty if the caddie accidentally stand on or close to an extension of the line of play behind the ball, rather than in trying to help in lining up. 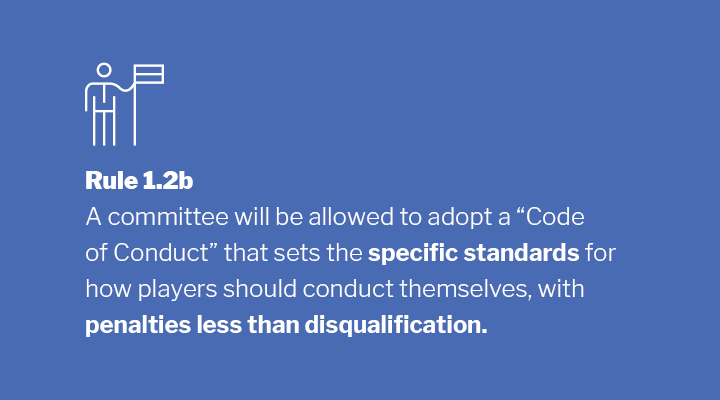 Breach of those standards could include a one-stroke penalty or a two-stroke penalty/loss of hole penalty for a player’s. 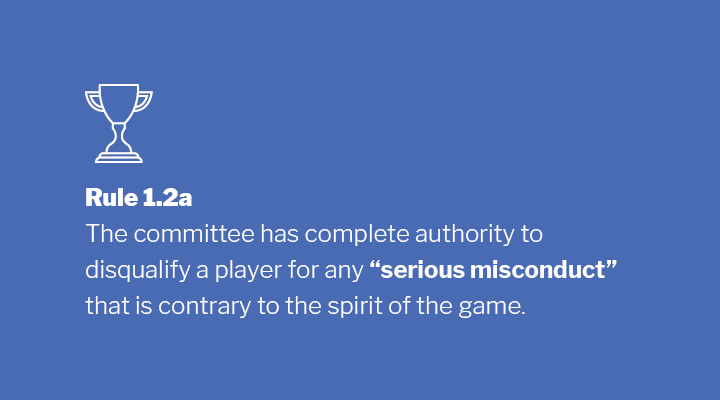 The committee will also still be able to disqualify a player for serious misconduct that is contrary to the spirit of the game, as emphasised in new rule 1.2a. A penalty area will include both (1) all areas currently defined in the rules as a water hazard or lateral water hazard and (2) any other areas the Committee chooses to define as penalty areas. Penalty areas may therefore include deserts, jungles, lava rock fields, etc. The two type of penalty areas will be known by the colour of their marking. 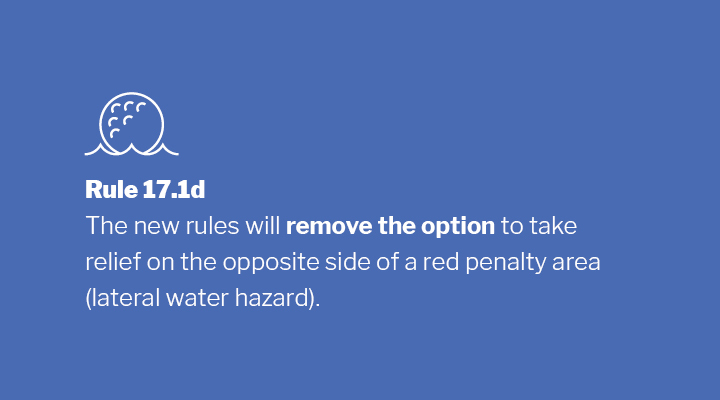 Red penalty areas (previously called lateral water hazards) and yellow penalty areas (previously called water hazards), and Committees will be given the discretion to mark all penalty areas as red so that lateral relief will always be allowed. The term “hazard” will no longer be used in the rules. When a ball is in a red penalty area, the player will only have three options for relief (all for a one-stroke penalty) rather than four options previously. Although, a Committee could still adopt a local rule allowing opposite side relief on those holes where it believes the other relief options are not viable. 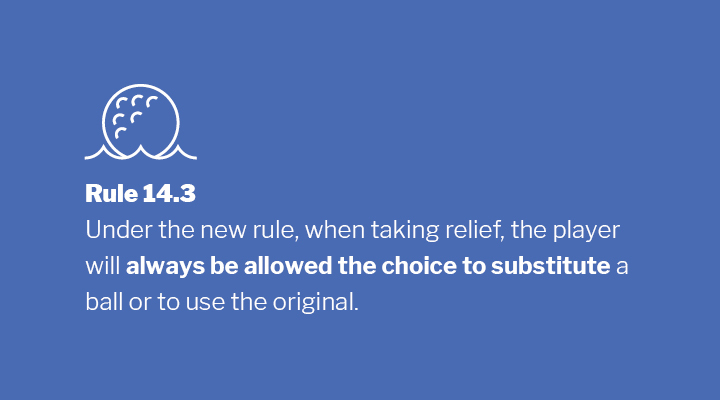 One of the relief options in the 2019 rules is going back on the line in the relief area. Another option is lateral relief from a red penalty area with a one stroke penalty. 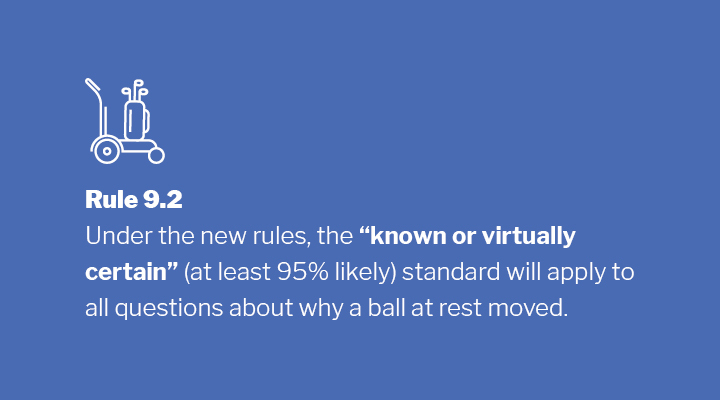 Under new rules, a player will be able to mark and lift the ball without the observation of another player. 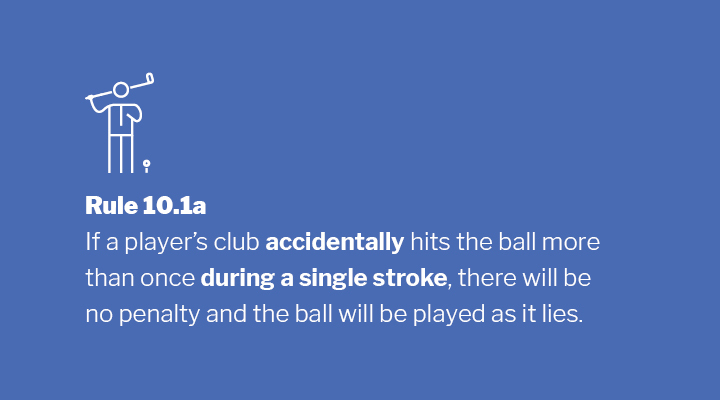 Although, players can still get a one-stroke penalty if he or she marks and lifts the ball without good reason to do. This update will simply the rules and speed up pace of play. Players should recognise that their pace of play affects others and should play promptly throughout the round. Playing “ready golf” and preparing for each stroke before a turn can significantly speed up play. Committees should adopt a pace of play policy to encourage efficient play by all players. Players are expected to play in the spirit of the game by acting with integrity, showing consideration to others and taking good care of the course. In place of the unclear concept of “breach of etiquette”, the new rules will use the more direct and stronger phrases “misconduct” and “serious misconduct”. A club-length will be defined as the length of the longest club in the players bag, except that this cannot be his or her putter. The relief area is a fixed size for each player and is pre-determined based on the clubs the player has selected for play. Using the longest club when measuring the size of a relief area will minimise inconsistency between players. 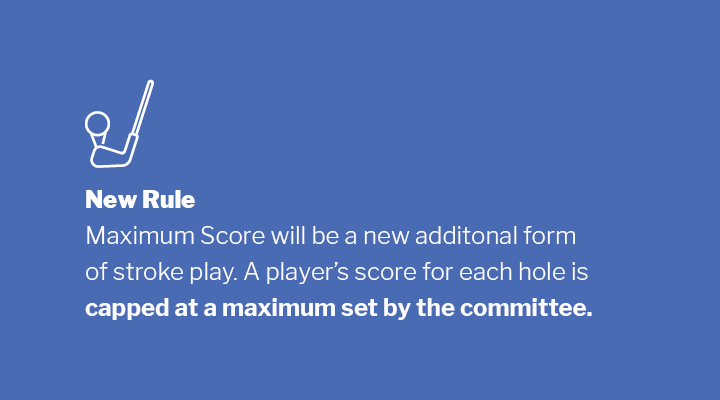 In maximum score, a player’s score for each hole is capped at a maximum set by the committee. This maximum could be fixed (such as 6, 8, 10 etc. ), related to par (such as two times par or triple bogey), or related to the player’s handicap (such as net double bogey). A player who does not complete a hole (often referred to informally as “picking up”) will not be disqualified, but simply gets the maximum score for the hole. 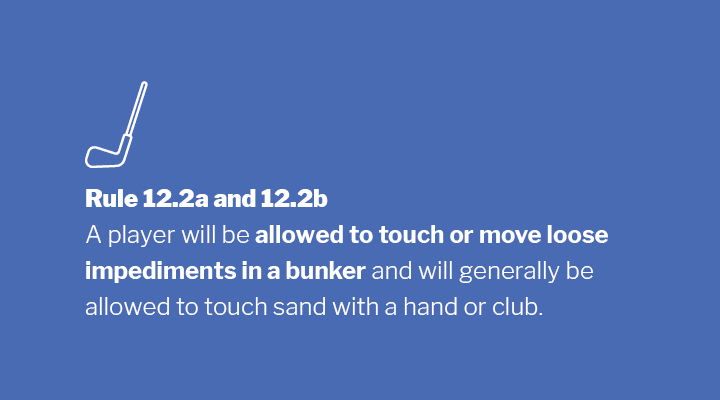 A player will be allowed to touch or move loose impediments in a bunker and will be generally allowed to touch sand with a hand or club. Although, a player still must not deliberately touch the sand in the bunker with a hand, club, rake or other object to test the condition of the sand to learn information for the stroke. 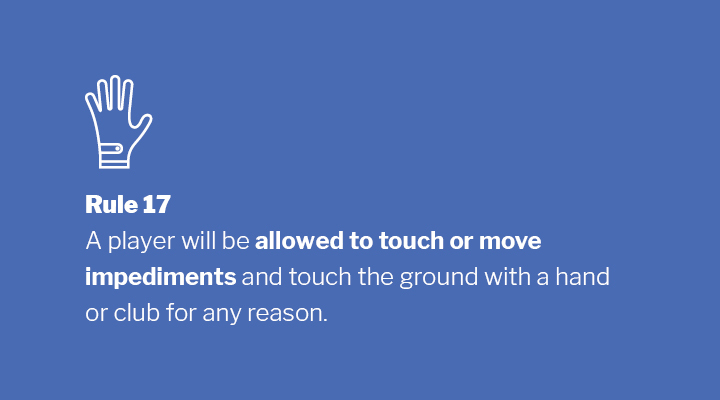 This also includes touching the sand in a bunker with a club in making a practice swing, in grounding the club right in front of or behind the ball, or in making the back-swing for a stroke. Previously a one stroke penalty. 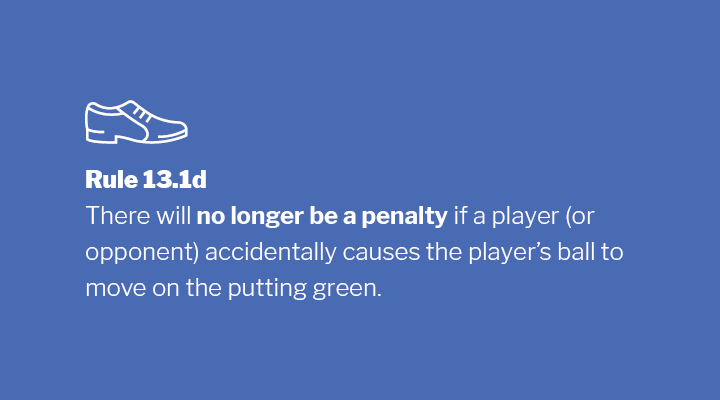 Under new rules, there will no longer be a penalty if a player (or opponent) accidentally causes the player’s ball to move on the putting green. Keep in mind penalties will still apply for carelessly knocking a ball in play when not on the putting green. Players will continue to drop a ball when taking relief, but the dropping procedure will be changed in several ways. 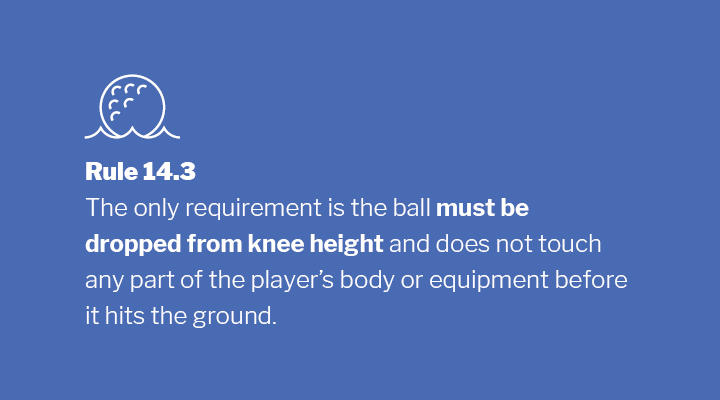 How a ball may be dropped is simplified; the only requirement will be that the ball be let go from knee height so that it falls through the air and does not touch any part of the player’s body or equipment before it hits the ground. 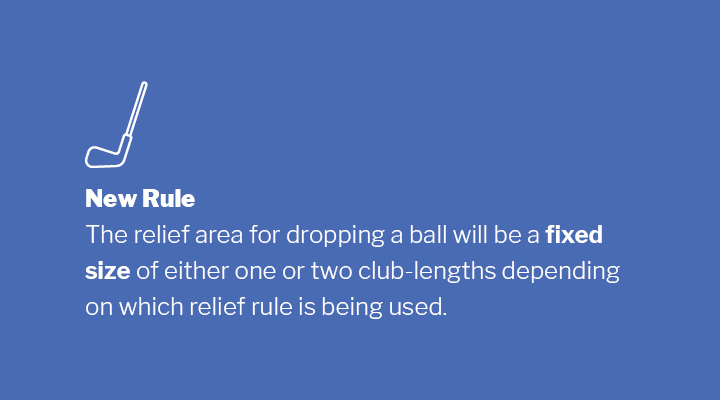 The focus of the dropping procedure will be on a specific “relief area” set by the rule under which relief is being taken and will be either one or two club-lengths from a reference point (and may have certain other limitations). 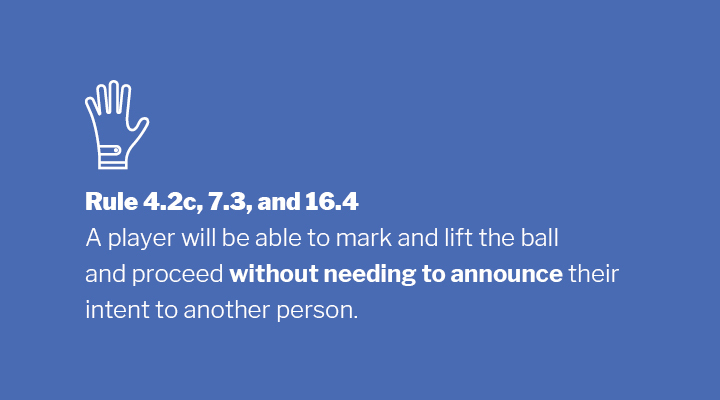 The ball will only need to be dropped in and come to rest inside the relief area; and there will be no re-drop requirement if the dropped ball accidentally hits a person or object after hitting the ground but before coming to rest in the relief area. If the dropped ball comes to rest outside the relief area, it will be dropped a second time; if it comes to rest outside the relief area after being dropped a second time it will be placed where it first touched the ground. If the placed ball will not come to rest on that spot after two attempts, the player will then place the ball on the nearest spot (not closer to the hole) where it will come to rest. 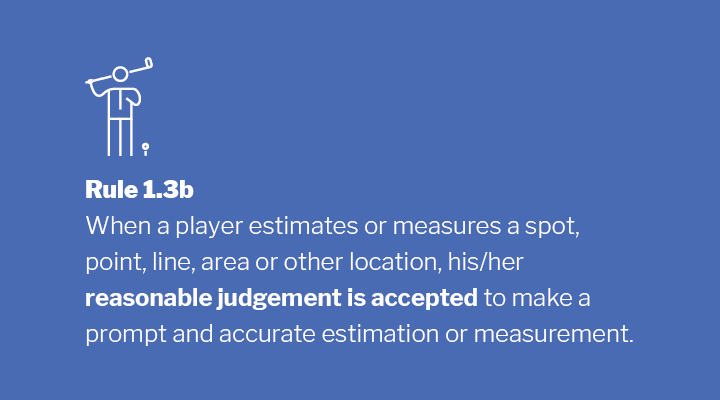 When a player estimates or measures a spot, point, line, area or other location, his/her reasonable judgement is accepted if the player did all that could be reasonably expected under the circumstances to make a prompt and accurate estimation or measurement. This means that the player’s reasonable judgement is upheld even if later shown to be wrong by other information (such as video technology). 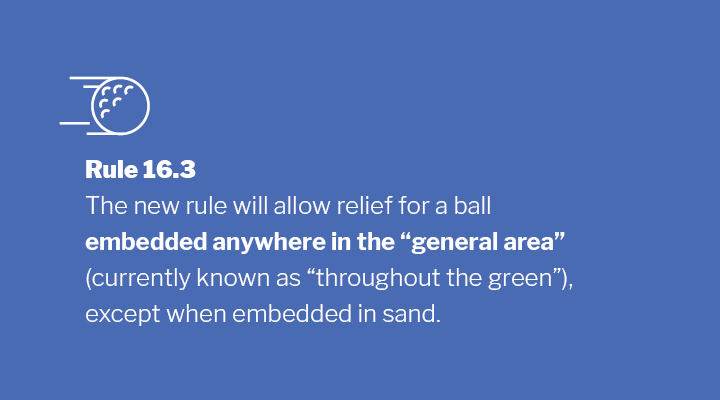 The new rule will allow relief for a ball embedded anywhere in the “general area” (that is, the area currently known as “through the green”), except when embedded in sand. Although, a Committee may adopt a local rule restricting relief to a ball embedded in those parts of the general area cut to fairway height or less. In taking relief, the player will drop the original ball or a substituted ball within on club-length of (but not closer to the hole than) the spot right behind where the ball was embedded. 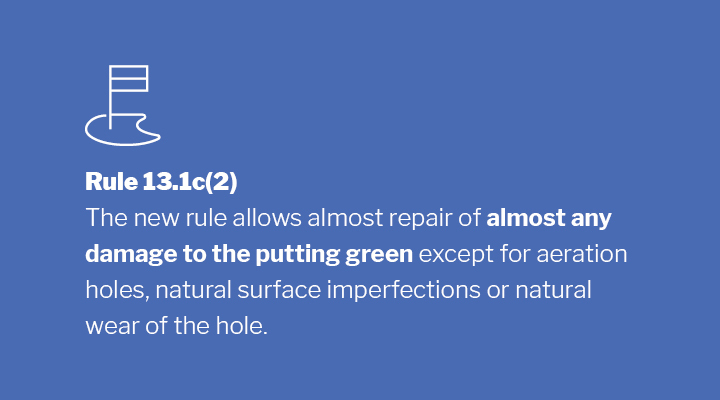 This new rule allows repair of almost any damage on the putting green. “Damage on the putting green” refers to all types of damage (such as ball-marks, shoe damage, indentations from a club or flag-stick, animal damage, etc. ), except aeration holes, natural surface imperfections or natural wear of the hole. The player can repair damage only with his or her hand, foot or other part of the body, or a ball-mark repair tool, tee, club or similar item of normal equipment and must not unreasonably delay play. In this situation the ball will always be placed on a spot rather than being dropped. 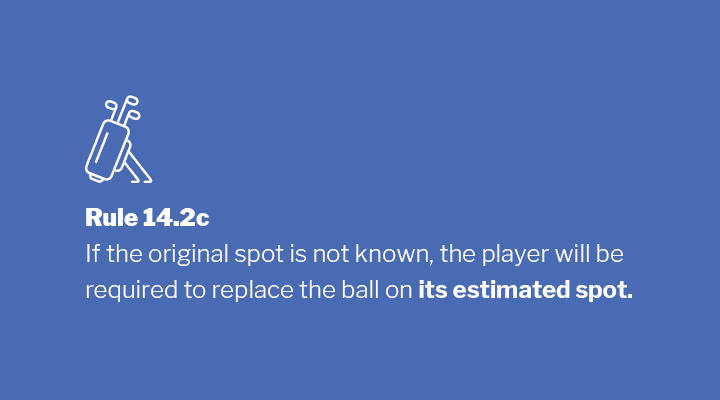 If the exact original spot is not known, the player will be required to replace the ball on its estimated spot (including on, under or against any attached natural objects that the ball had been at rest on). A player, opponent or outside influence will be found to have caused the ball to move if it is known or virtually certain to have caused the move. If the cause is not 95% certain, it will be assumed that natural forces caused the move and will be played as it lies. 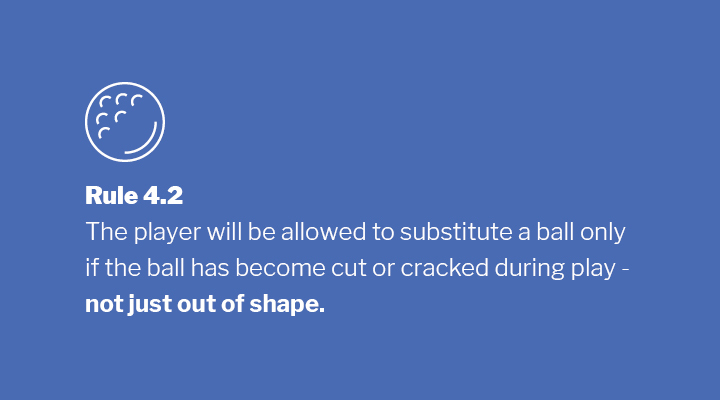 Players will no longer be required to announce the intention to lift to another person or to give that person a chance to observe the process or examine the ball for cracks. A small scuff or scrape does not qualify substitution of a ball during play of a hole. When taking relief, the player will always be allowed the choice to substitute a ball or to use the original ball, including when taking penalty relief as well as when taking free relief, and any other time the player is required to drop and play a ball, such as when returning play from where a previous stroke was made after the stroke is cancelled. This update will help improve pace of play. 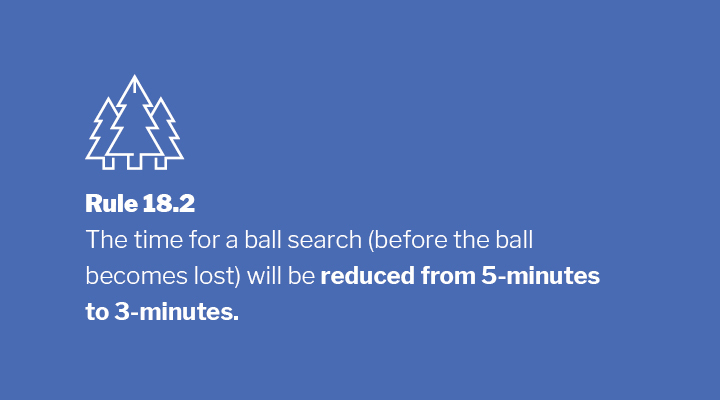 In most cases, If a ball is not found within 3-minutes of search it is unlikely that it will be found without interrupting the flow of the game. The prohibition for touching the line of play on the putting green will be eliminated. 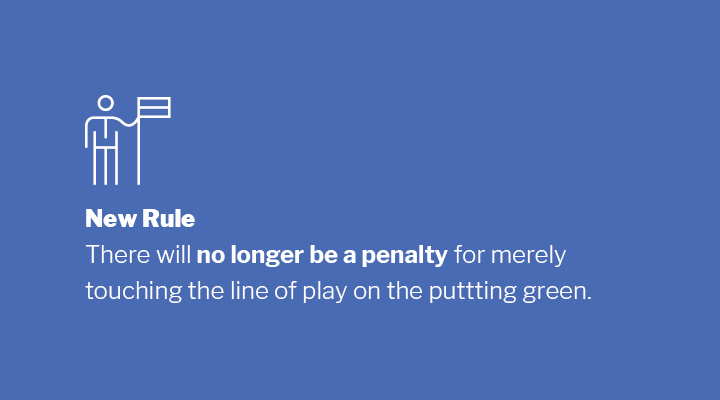 There will no longer be a penalty for merely touching the line of play on the putting green (the term “line of play” will apply everywhere on the course including the putting green, and the term “line of putt” will no longer be used). Although, players will still be subject to the prohibition on improving his/her line of play on the putting green. 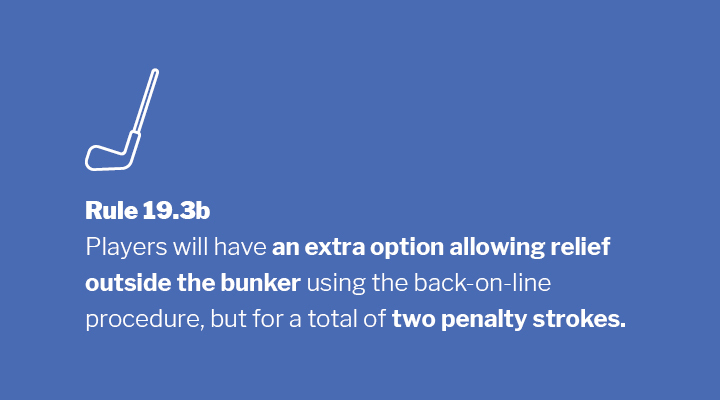 Players will have an extra option allowing relief outside the bunker using the back-on-the-line procedure, but for a total of two penalty strokes. Once the player takes a stroke inside the bunker, this option for relief in no longer available. 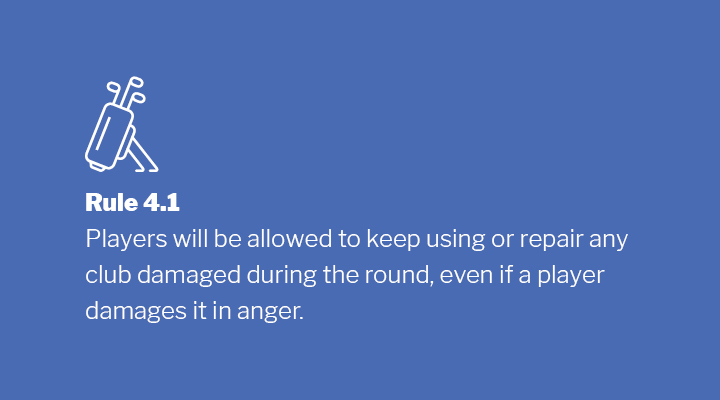 Keep in mind a player will not be allowed to replace a damaged club, except when it is damaged during the round by an outside influence, natural forces or by someone other than the player or his/her caddie. Distance measuring devices (DMDs) have become widespread over the years with use permitted at many clubs. Allowing the use of these devices will benefit pace of play and conform with modern golf. This new rule will revise the procedure for when a ball on the putting green is moved by wind, water or other natural forces, so that it must sometimes be replaced and sometimes be played from its new spot. 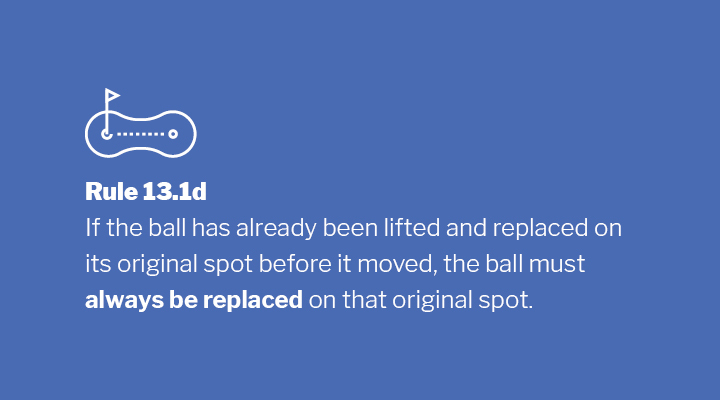 If the ball had been lifted and replaced on its original spot before it moved, the ball must always be replaced on its original spot, regardless of what caused it to move. The ball must be played from its new spot only if the ball had not been lifted and replaced before it moved.